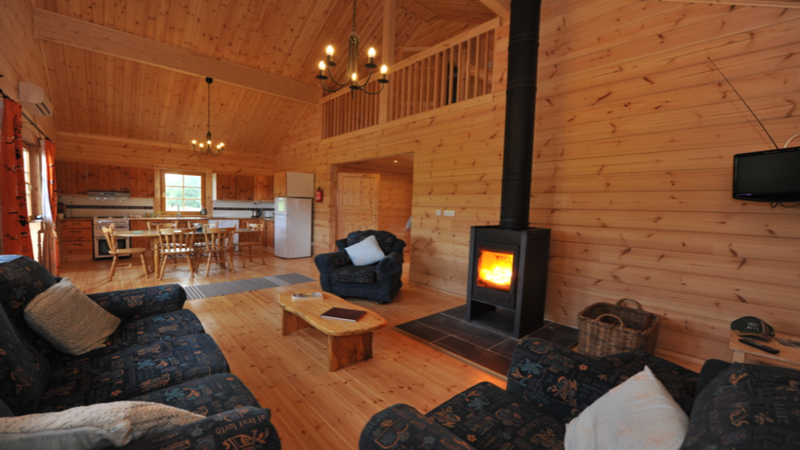 The four star approved Riverhaven Self-Catering consists of five cosy eco-friendly Scandinavian log cabins nestled into the shores of Lough Key and the Boyle River in an area of natural scenic beauty. Riverhaven is perfect for family holidays. Enjoy beautiful scenic walks around Riverhaven's own private forest or a stroll along the river. There is a private playground situated in front of the log cabins and families are free to roam the family farm and meet Misty the Connemara pony. Lake boats are available and are very popular with families. Life jackets are provided and outboard engines for those who wish to explore the beauty of Lough Key. A 5 minute drive from Riverhaven is Lough Key Forest and Activity Park, there is something for everyone in Lough Key from exploring the historic landscape to zip lining and woodland segway for the more adventurous! For more information on family holidays, click here. The cabins are situated in a perfect location to take advantage of all the outdoor adventures available in the area. Walking is a very popular pursuit with many beautiful walks near Riverhaven including; The Arigna Miners Way & Historical Trail, Knockvicar Bog Walk and Boyle Historical Walking Trail. The cabins are on the shore of Lough Key and the Boyle river so it is an ideal destination for fishing holidays. There is lots of information available at Riverhaven on the best fishing spots. Riverhaven is also perfect for those looking for a more relaxed holiday, Enjoy a romantic getaway in our log cabins where there is a special tranquility that can be found no where else. Wander through the woodlands and along the river taking in the beauty of the surrounding nature. Immerse yourself in the rich history of Riverhaven and learn about the archaeological excavations that took place there. For more information on the archaeology at Riverhaven, click here. *Sleeping capacity of 6 – 8 people in each cabin. *All Log Houses have a fully fitted Kitchen with all modern appliances, including a microwave, washing machine and dryer, satellite TV, DVD player, individual clothes line and clothes pegs per cabin, hairdryer, iron and Ironing board, hairdryer. *The comfortable living area has a wood burning stove. *En-suite bedrooms in all cabins. *Front & side roofed verandas. *A supply of linen, towels and a welcome pack of tea, coffee, bread, butter, milk, fire-lighter and timber for the stove is provided to all guests checking in to Riverhaven Self Catering. *Barbeque, travel cot and high chair available on request. *Secure parking and a large safe open area for children to play. *NOTE:- Rates may vary during Bank Holiday weekends and other holiday periods. Please see Special Offers page for periodical special offers at Riverhaven.